There were several reasons why I fell in love with Eddie Hardacre, but seeing a painter put the finishing touches to “E. HARDACRE, WATCHMAKER” on the shop front that had been in my family’s hands for over a century, I couldn’t remember any of them. My former fiancé was worse than a pirate. At least pirates were loyal to their crew. Loyalty was a bartering tool Eddie employed whenever he needed to gain someone’s trust. Someone like my poor, foolish dead father. And me. It was time to tell Eddie what I thought of him. I’d kept my anger bottled inside for long enough, and if I didn’t let it out, I would never heal. Besides, now was the perfect time, as a customer inspected one of Father’s watches. Eddie loathed public displays of emotion. I would give him the most public of emotional displays that I could. I tugged on my jacket lapels, threw back my shoulders, and marched past the gentleman’s shiny black coach and into the shop that should have been mine. The entrance was as far as I got. The familiarity of my surroundings pinched my heart. The rich scent of polished wood mingled with the subtle tang of metal. The myriad tick tocks, which irritated so many customers after mere minutes inside, summoned a well of memories. The individual rhythms sounded chaotic when placed in one room together but they reassured me that all would be well, that I had come home. It had been two weeks since I’d heard their song. Two weeks since I’d stepped inside the shop. Two weeks since Father died. Nothing had changed inside. The counter top stretched across the back, as sleek as ever. Behind it, the door to the workshop was closed. I recognized every clock hanging on the walls and set out on the tables, and all the glass display cabinets seemed to be filled with the same watches, from the inexpensive open faced variety to those with elaborately designed silver cases, known as hunters. Even Father’s ancient tortoiseshell and ormolu still ticked to its unique rhythm, but no one had bothered to correct it. It was three minutes slow. “I’ll be with you in a moment,” Eddie said without looking up from the watch he was showing the gentleman. Such poor shop-keeping! One should always make eye contact with every customer. A warm smile and pleasant greeting never went amiss, either. I ducked beneath his arm, turned so that I could keep him in my sight, and backed toward the counter. I wanted to see Eddie’s face turn ruby red as I informed his customer of his despicable behavior. “I am not your dear anymore, and I cannot believe that I ever wanted to be.” I used to consider him handsome, with his blond curls and blue eyes, and I’d once thought myself fortunate that he’d chosen me as his bride. My gratitude had been smashed to pieces, along with my future, two weeks ago. Now I thought him one of the ugliest men I’d ever seen . “India!” He lunged for me, but I was ready for him and stepped behind the table holding the collection of small mantel clocks. “Come here at once.” When I didn’t, he stomped his foot on the floor like a spoiled child not getting his way. He glanced past me to the gentleman who must have been quite stunned by my shocking behavior. I didn’t care what he thought. I had always been known as the prim and proper daughter of Elliot Steele, but recent events had changed me. Let the dusty old men gossip about me at the guild’s dining table. It no longer mattered, since I was not connected to the guild through Father or the shop anymore. Eddie suddenly dodged to the left. I swerved and moved farther around the table. He growled in frustration. I laughed and inched closer, daring him to try again. Part of me wanted him to catch me, so that I could force him to act like the overbearing brute I knew him to be in front of a customer. “You’re making a scene,” Eddie hissed. He might as well have announced that I was too old to wed. I was surprised he hadn’t used it as an excuse to end our engagement, but then again, he’d known my age before he proposed. “Nor am I hysterical,” I added. I only just heard the gentleman behind me clear his throat over the pounding of blood between my ears. Eddie must have heard it too, and he collected himself. He licked his lips again, a habit that I now despised. I thrust my hand on my hip, smiled, and spun round to speak to the gentleman and make an even bigger scene. An extremely tanned man with dark brown eyes, striking cheekbones and thick lashes stood there. If it weren’t for his scowl, and the signs of exhaustion around his mouth and eyes, he would be handsome. He was everything Eddie was not—tall and dark and broad across the shoulders. He wore a well-tailored black suit, untroubled by his impressive frame, a silk hat and gray silk tie. While his clothing screamed gentleman, his stance did not. He leaned one elbow on the counter as if he were half drunk and needed propping up. A gentleman would have straightened in the presence of a woman, but this man didn’t. Perhaps he wasn’t English. The deep tan would suggest not. It took me a moment to remember what I’d been about to say, and in that moment, he spoke first. “I have business to conduct with Mr. Hardacre,” he said in a flawed upper class English accent. It was plummy enough, but the crispness had been sliced off and replaced by a slight drawl. “Please take your argument with you when you leave.” He held his hand out, showing me the door. Eddie made a strangled choking sound. “So you already pointed out,” the customer said. He sounded bored, but that could have been a result of his accent. “Is that the man you want to give your custom to?” I pressed. Eddie chuckled. My hand slid off my hip and fisted at my side. I swallowed down the sense of hopelessness that threatened to overwhelm me. My scheme to discredit Eddie was quickly unraveling before my eyes. “Then you’re aiding and abetting a man with the morals of a rat. He doesn’t care who he ruins to get what he wants, only that he gets it in the end, by whatever means necessary.” I heard how pathetic and desperate I sounded, yet I couldn’t stop the words from spilling forth anyway. I was tired of holding them in, of smiling and telling acquaintances that I would be all right. I wasn’t all right. I was pathetic and desperate. I had no employment, no money, and no home. I’d lost my fiancé and my father, within days of one another, although I’d never really had the fiancé, as it turned out. Our engagement had been a ruse, a way to get Father to sign over the shop to Eddie. “I am sorry, miss,” the gentleman said, sounding genuinely sympathetic. Two long strides brought him to me so that I got to admire his impressive height and frame. But not for long. Two large hands clamped around my waist, lifted me, and tossed me over one of those brawny shoulders I’d been admiring. He did not. With one arm clamped over the backs of my thighs, he strode to the door as if I were nothing more than a sack of flour. The blood rushed to my head. My hat hung by its pins. I pounded his back with my fists, but it had no effect. I was utterly helpless and I did not like being so, one little bit. Behind me, Eddie roared with laughter. I felt the gentleman’s muscles tense and heard a sharp intake of breath. He didn’t slow, however, but merely pushed open the door and deposited me on the pavement. I stumbled and he clasped my shoulders until I regained my balance, then he let me go. “Cyclops,” the man said to someone over my shoulder. I glanced around to see a giant figure with a black patch over one eye jump nimbly down from the coachman’s perch and advance on me. I swallowed a scream and shrank away, but he caught my arm. I tried to pull free but he caught my other arm and his grip tightened. The red, lumpy scar dripping from beneath his patch stood out against his charcoal skin, the white of his teeth even more so as he bared them in a snarl. Mr. Macklefield, the neighboring tailor, took one look at the giant and fled back inside his shop. Up and down the street, shopkeepers shut their doors. Folk I’d known my entire life cowered inside. Even the painter went very still on the top of his ladder, as if he hoped no one would notice him there. No one came to my rescue. I’d never felt more alone or so vulnerable. I glanced up at the giant who held both my wrists and blinked back hot tears. “Please let me go,” I whispered. “I won’t be long,” the gentleman behind me said. “I see.” I drew in a breath, let it out, and stomped my heel into the giant’s boot. He winced and his one eye widened, but he didn’t let me go. I ought to have been frightened witless, but their light-hearted banter quelled my fear. Not that I felt safe and confident, but I no longer felt like the giant or his master wanted to hurt me. “I need to ask you some questions first,” the gentleman, Mr. Glass, said. “India!” Eddie shouted. “If you don’t calm down, I’ll send for a constable.” He clicked his fingers at Jimmy, the boy who occasionally ran errands for the shopkeepers in the street. He was the only one who’d not retreated indoors, but that would be because Jimmy wasn’t allowed in the shops. None of the shopkeepers trusted him not to steal from them. None since Father had died and Eddie had evicted me, that is. He strolled over, hands thrust deep into his pockets, but hung back, clearly not willing to take Eddie’s side but unable to do anything to help me. Mr. Glass turned a curious expression toward me. Where before he’d looked tired, he was now alert. It was as if he’d just realized something of monumental importance to him—and it involved me. His gaze focused on mine with fierce, driving intensity. It was an unnerving experience to be the object of it, more so than the physical presence of his coachman. If I weren’t restrained, I would have left and been glad to have escaped—from what, I didn’t know. “You’re familiar with Mr. Mason and his work?” he asked me. “I am. He was both a friend and rival of my father’s.” Their relationship had been a complicated one. While they respected and liked one another, they had to compete for customers among London’s elite. Fortunately there were enough wealthy in the city to keep them, and several other watch and clockmakers, in business. Mr. Mason had been the first person I’d gone to after Eddie had ended our engagement, but he’d not been able to employ me with three sons and a daughter of his own. Mr. Glass closed his eyes and rubbed his forehead as if trying to remove an ache. It was so odd, coming after his intense glare, that I checked with his servant to see if he thought it out of character. “I’m fine,” Mr. Glass snapped. “Don’t bloody look fine,” the coachman muttered, sounding a little hurt. 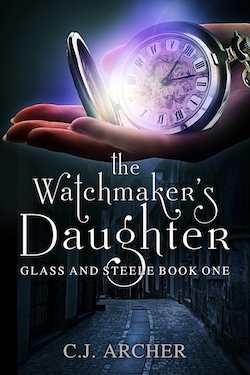 “Your father is a watchmaker?” Mr. Glass asked me, lowering his hand. He patted his coat, as if feeling for something in the pocket. Perhaps it was snuff or a pipe that he wished to smoke to return the color to his cheeks. He looked quite peaky. “Was.” I spread my hands to indicate the shop windows with the watches set out on the lower shelf and the higher shelves filled with clocks of all shapes and sizes. “He owned this establishment under the name Steele until his death, two weeks ago.” I swallowed the lump rising up my throat, but the tears welled nevertheless. “He left it to me in his will,” Eddie cut in quickly. “Because you assured him that you would keep your promise to marry me, and my fool of a father believed you. I believed you,” I choked out. I no longer cared what the gentleman or his servant thought of my behavior. Two weeks ago I’d been too sad and shocked to tell Eddie what I thought of him, but not anymore. I was still sad, but those two weeks had given me time to think. I wasn’t shocked now, I was mad. I gritted my teeth and pulled myself free from the man holding me. To my surprise, he let go. I barged up to Eddie and slapped him across the cheek before he saw my hand coming. Eddie reeled back, clutching the side of his face. He stared open-mouthed at me, his expression caught between fear and shock, as if I were a ghastly and strange creature. I suppose, in some ways, I was. I certainly didn’t feel like myself at that moment. I felt…lighter, liberated, and yes, very strange indeed. I smiled at him and his one-eyed servant. The coachman grinned back. “Yes, Mr. Glass?” I said. The brown eyes briefly flared and a small smile touched his lips. It quickly vanished, however, and his jaw went rigid. The muscle bunched and did not release. It was as if he were bearing down against a pain. Unease ate at my gut. I didn’t know this man, and he had a rather frightening looking servant, yet I’d agreed to drink tea with him. It would seem today was a day to do things that were out of character for me. I pushed my unease aside. “You mean your father couldn’t,” Eddie said smugly. I walked up the street, feeling as if the entire city watched me. I turned the corner and doubled back, just in time to see Mr. Glass being driven away. He removed his gloves and studied something in his hand. He closed his fingers around it, tipped his head back, and breathed deeply, as if he were finally getting the rest he craved. It wasn’t this behavior that set my pulse racing, however. It was the object in his fisted hand, and the bright purplish glow it emitted. A glow that infused his skin and disappeared up his sleeve. She certainly wasn’t. She wanted the rent for the tiny attic room in advance and reminded me every day, when I failed to pay her, that I would have to vacate if I didn’t come up with the money. I’d managed to keep the room through a combination of charm and pleading, but I didn’t think that tactic would work much longer. Going by the unsympathetic scowl on her pinched face, her patience had worn out. The truth was, I hadn’t anticipated staying in her lodging house long after Eddie threw me out of my home above the shop the day my father was buried—the very day. I thought I would have secured myself employment as a shop assistant with either a watch or clockmaker by now. But I’d applied in person to every single one in the vicinity, and none had any positions available, although some expressed their sympathies for my plight. Unfortunately I couldn’t eat sympathy or sleep on it. I needed to work. Hence my applications to other shopkeepers. So far, three haberdashers, two drapers, four greengrocers, and a chemist refused to employ me without references. I was utterly weary of hearing the word no. I had been a watchmaker and repairer, actually, but I didn’t correct her. No one ever believed me when I claimed my father taught me everything he knew. Not even my friend, Catherine Mason, whose father and three brothers owned Mason And Sons. She’d told me that no honorable father would allow his daughter to get her hands dirty in the workshop. I liked Catherine so I didn’t argue the point with her. I shuddered. The workhouse was for those with no roof over their head, no education, and no other possible means of supporting themselves. Employment there meant a bed to sleep on and food twice a day, albeit a lice-ridden bed and unpalatable gruel. It also meant long hours on the factory floor, risking life and limb with the dangerous machinery, and contending with depraved men who thought the poor women were no better than whores. A perfectly healthy woman I’d been acquainted with had wound up in one after her husband died. When I’d seen her again, a year later, she’d been at death’s door, ravaged by syphilis and coughing up blood. The workhouse was a wretched place. It made Mrs. Bray’s cold attic room, with the low roof and persistent odor of cat urine, seem like a palace. If I couldn’t find employment elsewhere, the workhouse was my only choice. I stood at the top of the stairs and stared at her retreating back. The Masons couldn’t afford to support me, not with so many of their own mouths to feed. I would have to sleep on Catherine’s floor. They would try to help me if they knew my plight, but I couldn’t bring myself to beg. Pride was all I had left. Arrested! From the look on her face, she was serious. I headed back into my room and numbly packed my bag. Having sold as many personal items as I could to pay for food and rent for the last two weeks, my few remaining belongings amounted to very little. I possessed two changes of unmentionables, a nightgown, one other dress, a coat, and a hairbrush, hand mirror and combs that had belonged to my mother. My bag was so light that I had no trouble getting it down the stairs. Mrs. Bray saw me out and shut the door the moment I crossed the threshold, almost hitting me in the back. I walked as erectly as possible down the steps to the pavement, my battered leather valise in hand. It had been a gloomy, damp house anyway. I would find somewhere better to live, just as soon as I secured myself employment. In the meantime, Catherine Mason’s floor would have to do. I wouldn’t rely on the Masons’ charity for long, however. I wouldn’t need to. I was eminently employable, if only someone would give me the opportunity to prove it without references. After meeting with Mr. Glass, I would apply at the Governesses’ Benevolent Institution. I could even ask him if anyone in his circle was in need of the services of an educated woman. Indeed, this meeting with Mr. Glass could prove quite fruitful. I had a good feeling about it. I walked from the lodging house near King’s Cross Road to Mayfair. It took almost an hour, but the air was reasonably clear, allowing some spring sunshine to leak through the gray pall. I knew the way well enough, having delivered timepieces to wealthy customers who lived there. I’d even delivered an exquisite watch to a foreign prince when he’d stayed at Brown’s Hotel. Nevertheless, the colonnaded façades of the grand buildings never ceased to amaze me and make me feel small. My valise no longer felt light by the time I reached Albermarle Street, and my shoulders and arms ached. The liveried porter of Brown’s Hotel opened the front door for me. I ignored the questioning arch of his brows and his pointed glance at my simple dress and valise, and strolled inside with what I hoped was an air of confidence. I wanted to at least look like I knew where I was going, even if my stomach had tied itself into knots. The porter stowed my valise away in a back room and directed me to the tearoom. I received more curious stares as I scanned the faces for Mr. Glass. Plain shop girls didn’t usually mingle in the tearoom at Brown’s with ladies and gentlemen of good breeding. I felt like a drab piece of sackcloth amid colorful silks and delicate laces. I spotted Mr. Glass at a table near the window. He rose and greeted me with a dashing smile that I couldn’t help but return, despite my knotted stomach. He must have had a good rest since we last met, because there was no sign of tiredness in his eyes. They were as clear and warm as his smile. There was also no sign of the purplish glow on the skin of his bare hand. It appeared quite as it should—tanned, strong, and entirely normal. “Thank you for coming, Miss Steele,” he said, pulling out a chair for me. We were interrupted by the waiter, and my awkwardness returned. Not only was I unsure if I was expected to pay for my afternoon tea, but everyone at the surrounding tables still stared. Was I the oddity or was Mr. Glass, with his good looks and somewhat lazy way of sitting? Or was it the both of us together? None knew me, but it was quite possible that Mr. Glass’s acquaintances were among the other patrons and his meeting a woman like this was about to become the gossip of the week. “Er, no.” As long as I wasn’t expected to pay for them. Despite the strangeness of Mr. Glass and his relaxed manner, I did peg him as a gentleman, and no gentleman would invite a lady to tea and then ask her to pay her share. The waiter retreated and Mr. Glass sat forward. He picked up the small silver fork and twisted it between his fingers. “You must think my request to meet with you odd,” he said. He gave me a blank look. The waiter arrived with a silver tea-stand laden with slices of cake, sandwiches and pastries. I’d never seen so many all at once before, or presented so prettily. My stomach growled. I hadn’t eaten since that morning, and then only a slice of moldy bread that Mrs. Bray had been about to throw out. Mr. Glass eyed me from beneath long lashes but didn’t comment. He waited until the waiter poured our tea and left us with the pot before urging me to fill my plate. I took a delicate pastry and ate it in two bites before he’d even begun. He nudged the cake-stand a little closer to me and I took a slice of cake and ate that. At his further prompting, I shook my head. “I’m quite full, thank you,” I lied. My mother had always told me not to make a pig of myself, and I mostly followed her advice. I tried not to look at the cakes for fear of showing my regret, however. If he was going to be so gentlemanly about it, then I might as well. He sipped his tea, and I had to suppress a giggle. He looked out of place in a room full of mostly women, a pretty floral teacup in one hand and a pastry in the other. I wondered if he did this sort of thing in America. If I had to guess, I’d say he was a gentleman farmer with those brown hands of his. “Do you mind if I start asking you questions now?” he said. He set the cup down carefully, as if he were afraid he’d break it. He stared at the contents for a moment, and when he looked up, that intense stare he’d given me earlier in the day returned. A shiver trickled down my spine and chilled my skin. I couldn’t make up my mind if I liked being looked at in such a way. “How old was your father?” he asked. I arched my brow and waited for an answer. “Father has never left England anyway. He’s lived above that shop all his life, as his father did, and his father too. Now Eddie has it,” I spat. He passed a hand over his eyes and down his face then blew out a breath. It must be a very special watch indeed to elicit such a reaction. I could feel his anxiety from across the table. “You have it,” he said, absently patting his coat pocket. Pay me! Ah, now I understood why he’d chosen me instead of Eddie, or anyone else. He must have sensed my desperation this morning and guessed I had the time to devote to such a scheme. “If you insist,” I said as graciously as I could manage while trying to hold back my smile. “What is the current wage for a shop assistant in London?” he asked. I shook his hand firmly, as my father had always taught me when shaking a man’s hand after a particularly lucrative transaction. “Deal,” I repeated, mimicking his accent. I ate a slice, touched my napkin to the corners of my mouth, and washed it down with a gulp of tea. I wasn’t being very ladylike, but I was no lady and he didn’t seem to notice. Mr. Glass remained silent, and I wished I hadn’t blurted out my problems all over again. He must think me as pathetic as I felt. “My mother used to tell me that God would punish people like that after they’re dead,” he said. One corner of his mouth kicked up. “You and I think alike.” He lifted his teacup in salute. Finding it empty, he refilled both mine and his. “Will you be staying in London long after you’ve found the old watchmaker?” I heard myself ask with a hint of breathiness in my voice. He didn’t elaborate, and I got the feeling he no longer wanted to discuss his past in Broken Creek. We discussed returning to Clerkenwell’s watchmakers, but in the end, decided to investigate the better class of horologists elsewhere in the city. Mr. Glass insisted the man he’d met five years ago had been educated with a middle class accent and not a slum one. After spending most of the morning in Clerkenwell, he’d already learned the difference. Fortunately I knew most of those watchmakers well, since Father had been friendly with them back when he still liked and respected the guild members. A twang of guilt over my role in his falling out with the guild twisted my gut. He’d fallen out with the other members over my application. Once the teapot was empty and most of the delicious confections gone, Mr. Glass patted his jacket pocket and stood. The waiter brought hat and gloves, and Mr. Glass paid for the both of us. He escorted me to the hotel entrance, but I hung back to retrieve my valise. I had planned on waiting until he’d gone, but he seemed to be waiting for me to exit first. “Are you staying here at Brown’s?” I asked him. “No, I have a house not far away,” he said. I didn’t ask how someone who’d never set foot on English soil until two days ago could possibly have a house, but perhaps there was a family link somewhere. It would explain part of the accent and the fact he had a lawyer. “Thank you, Miss Steele. I enjoyed your company today,” he said. Oh dear. He wanted me to leave first. Should I go and come back for my valise after he’d gone, or let him see it and know I was now homeless? The decision was made for me by the porter I’d met upon entering. He deposited the valise at my feet. “You almost forgot your luggage,” he said with a wicked gleam in his eye. He bowed and left. With a clenching of back teeth, I turned to Mr. Glass. He was frowning at my valise. Since the cat was out of the bag, I might as well give it a further nudge. I had nothing to lose. He glanced around. “Pretend to grow teary,” he said quietly. It took me a moment to realize he wanted to conduct the transaction in a way that would protect my reputation. I sniffed and touched my finger to my lowered eyes while he surreptitiously folded some coins into his handkerchief. He handed it to me, and I used it to dab away my fake tears before dropping it into my reticule. The transaction was all very clandestine, and I was quite sure no one had noticed and come to the wrong conclusion—or the right one, as the case may be. “Miss Steele, am I correct in assuming that you’re on your way to a new abode today?” He nodded at the valise. “I’m going to my friend, Catherine Mason’s, house.” It wasn’t quite a lie, and it would be too embarrassing to tell him that I’d been thrown out of the lodging house I’d been staying in for the last two weeks. “It wouldn’t be a London sky if it was blue and high.” I picked up my valise and the porter held open the door for me. Mr. Glass followed me outside and down the steps. “I’ll collect you in the morning from the Masons’ house,” he said, brushing his thumb over his jacket pocket in what struck me as an absent-minded motion. It was at least the third time he’d done it this afternoon. Whatever was in there must be important—perhaps that strange glowing object. “Be careful of pick pockets,” I said. A bubble of laughter almost escaped, but I swallowed it down. He looked quite serious and more than a little annoyed. I couldn’t think how my warning would annoy anyone, but I shrugged it off. “What time tomorrow?” I asked. “Not for me.” Clearly he wasn’t like other men of his ilk who slept in until noon. He gave me a curt nod and I went on my way. I couldn’t help stealing a glance from the street corner, but Mr. Glass had already left. The omnibus route was indeed close, and I didn’t have long to wait before one rattled by. Fortune was smiling on me that afternoon because I managed to get a seat inside, facing a gentleman reading a newspaper. When Father’s eyesight deteriorated, I read him the newspaper every evening, but I hadn’t bought one since his death. I’d needed to save every penny. I quickly scanned the front page for something interesting. There were several articles, but one headline stood out above all others: AMERICAN OUTLAW SIGHTED IN ENGLAND. My chest tightened. My blood ran cold. No, surely not. Surely the handsome and gentlemanly Mr. Glass wasn’t an outlaw. Surely his recent arrival here and that of the man depicted in the newspaper’s sketch with WANTED printed above it was just a coincidence. It was difficult to tell if they were one and the same from the black and white drawing. The outlaw had a scruffy beard and moustache, and wore a large hat pulled down over his face. That’s what an outlaw looked like. He wasn’t well dressed and cleanly shaved. Wild West outlaws were filthy and crude. They behaved like…cavemen. What had I got myself into? I read as much of the article as I could before the man and his newspaper alighted from the omnibus. It claimed that very little was known about the outlaw, not even his name. He’d been dubbed Dark Rider by the Las Vegas Gazette because no one had seen his face and his crimes were committed during the night. Dark Rider had held up stagecoaches, stolen horses, and murdered a lawman who’d tracked him down. A colorful account of the aborted arrest took up most of the article, but what caught my eye was the final paragraph. A reward of two thousand dollars was being offered for his capture. I didn’t know how much that was in English money but it was an impressive number. It had to be more than the pound’s worth of coins now sitting in my reticule. I couldn’t stop thinking about it and the outlaw the rest of the way to the Masons’ house. “Why would he mind? India is my oldest friend, and she needs us now.” Catherine squeezed my hand and rolled her eyes. “He’ll be home shortly,” Mrs. Mason said, giving the dough a particularly heavy beating. The Masons kept no maid, and whenever I saw Catherine or her mother, they wore aprons and could be found in the kitchen. Their house was perpetually full of delicious smells. Mrs. Mason stopped kneading. “A penny or two would help to ease Mr. Mason’s mind.” She smiled, more genuinely this time. “You’re a sweet friend to our Catherine and always welcome here. It’s just that…” She shook her head and glanced at the door. “What is it, Mama?” Catherine prompted. “Oh. I didn’t think about that,” I said. “Ronnie and Gareth are like brothers to me,” I said. Hopefully it was enough to reassure her that I wasn’t about to trap her sons into marriage. Admittedly it stung that she thought I would. She must also know that her sons would have no interest in me, no matter what methods I used to trap them. Like Catherine, the Mason boys were all attractive and fair. They could have their pick of girls. I was too old for them, and too plain with my straight brown hair, short stature and a waist that refused to shrink to a more fashionable size no matter how tightly I pulled my corset laces. Catherine led me by the hand up the stairs to her room. She shut the door and tossed herself onto the bed. She patted the mattress beside her. “Ronnie heard a rumor that you confronted Eddie. Is that so? Tell me what happened.” Her long pale lashes fanned over her big blue eyes in innocent wonder. It was not surprising that she had several suitors vying for her hand. A few years younger than me, and quite a lot taller and prettier, the youths always followed her about like puppies. She seemed to enjoy the attention, but I expected it must get tiresome after a while. “I tried,” I told her. “I did manage to ruin a transaction with his customer.” Although I was no longer sure if Mr. Glass was there to purchase a watch after all. I must have sounded convincing because she seemed to believe me. The truth was, I did blame Mr. Mason for not standing up to them. Father had said he’d sat quietly and not said a word during the meeting among the senior guild members at which my application for membership had been tabled. A mere week before that, Mr. Mason had urged me to apply. The about-face baffled me. The relationship between our two families had never been quite the same again, although my friendship with Catherine remained unchanged, thank goodness. I knew so few other women of similar age that the loss of her friendship would have been worse than my broken engagement to Eddie. “I’m hardly perfect,” I scoffed. “Father has always appreciated brains over beauty.” She patted her bouncy blonde curls. “Some men do, you know,” she added, as if such men were a rarity. She broke into giggles again. I rolled my eyes, but her words were quite a shock. Did men truly find me intimidating? All men, or just pretty brainless twits like her younger brothers? She gasped. “Then you must wear something prettier than that old dress.” She jumped up and opened the drawer where she kept her gowns. I sighed and succumbed to her ministrations. She plucked out the pins and ran her hands through the tresses. I told her his name and that he was American with possibly some English heritage. She oohed and aahed as I thought she would and bounced on her toes when I told her he had a house in Mayfair. I told her everything I remembered from our conversation. I didn’t tell her there was quite a good chance he was a Wild West outlaw on the run. “She shouldn’t stay here.” Mr. Mason’s hissed voice could barely be heard over the clatter of pots and pans in the kitchen as Mrs. Mason washed dishes. He had dismissed all of us except his wife after the evening meal. Throughout dinner, he’d cast odd looks my way, as if he were seeing me in a new light. It was so strange that I’d almost asked him if something was amiss, but decided against it. He must simply feel peculiar having me stay in his house without Father, and perhaps he missed Father’s company too. I’d returned to the kitchen for a drink, but stopped upon hearing Mr. Mason’s whisper. “She’s too close to Catherine,” he went on. I leaned closer. “You don’t understand,” he said heavily. Although I couldn’t see him, I pictured him sitting at the table, running his hands over his bald head. A chair scraped and footsteps approached. I hid in a dark recess and waited for him to leave before I returned to Catherine’s room. My feet felt like logs, my heart sore. Why didn’t Mr. Mason want me here? Was I truly a threat to his sons? Did he think me no longer a virtuous woman now that my father was gone? I could think of no other reason—nothing else had changed since I’d last seen him. So why did he no longer want me near his family? “You didn’t bring up the jug,” Catherine said when I returned to her room. The noses of the entire Mason household were pressed against the front window when Mr. Glass arrived in his carriage. The men tossed out words like coupler, shafts and axles as if they were coachbuilders not watchmakers, while the women argued about how much he must earn a year to own such a handsome conveyance. I opened the door and went out to greet him. “Good morning, miss,” said Cyclops from the driver’s seat. “Forgive me for not coming down, but I only got one good foot left and I don’t want to risk it.” He flashed a grin as wide as his face and tugged on his cap. “I don’t think pirates have such nice smiles.” My flippant response may have been to tease her a little, but in truth, my heart was hammering. It wasn’t in my character to ride in carriages with strange men. If my parents were here, they’d disallow it or insist on coming along. I knew the Masons wouldn’t treat me the way they’d treat their own daughter, but it was kind of Mrs. Mason to act as my conscience. On this occasion, however, I was going to ignore it. I couldn’t afford to be cautious. It wasn’t just the pound that was at stake anymore, it was the two thousand American dollars. Mr. Mason had avoided me all morning. Well, perhaps not avoided me. He’d gone to his workshop before I’d woken. While I wanted to know for certain why he no longer thought me a good influence on Catherine, I also didn’t want to be told to my face that I was a poor example. My stretched nerves couldn’t take any more strain. Besides, I was grateful not to have been thrown out of the house. Mr. Glass shook the hand of each member of the Mason family as the head of the household introduced them. “You’re still looking for your watch’s maker?” Mr. Mason asked. “I am,” Mr. Glass said. “Most watches don’t differ greatly from one another, you know. I’m sure I can manage to work it out if it’s one I haven’t seen before.” He laughed a little nervously, making his jowls shake. Mr. Mason clasped the button edge of his waistcoat over his stomach. Mrs. Mason was an excellent seamstress and could modify a great many items of clothing, but she couldn’t make her husband’s waistcoat larger to fit over his increasing girth. “What makes this watch particularly special?” Mr. Mason pressed. The nervous laughter had died, and he now seemed anxious to catch every word that fell from Mr. Glass’s lips. He climbed in and Gareth folded up the step and closed the door. Cyclops had the horse pulling away from the curb before Mr. Mason could speak another word. The poor man stood there, his mouth open, his eyes darting between Mr. Glass and me. He’d gone a little pale, which hadn’t escaped his wife’s notice. She clutched his arm but he seemed not to register her presence. I waved to Catherine through the window and tried not to show her how anxious I felt. By the look on her face, she was anxious enough for us both. I was about to protest that no one needed that long to eat luncheon, but held it in check. Perhaps long lunches were an American custom. It wasn’t my place to disagree with him when he was paying me. Nor was it my place to ask him why he was so tired this morning, although the curiosity would probably force me to at some point during the day. He was silent a long time in which I could feel his gaze on me as I pretended to take interest in the passing scenery through the window. “You can stay in my house for the duration of your employment,” he finally said. I gasped and snapped my gaze to his. I was lost for words, something that happened rarely. He smiled, sending my already rapidly beating heart plunging. “Well?” he prompted. I should say that it was without hesitation. I ought to insist on finding my own accommodation. But it would be wonderful not to have to worry about it for the week. And living in the same house as Mr. Glass would make it easier to spy on him and learn the truth. If I locked my door at night and slept with a knife under my pillow then I ought to be safe. Besides, the newspaper article didn’t say the outlaw attacked women, only stole horses and robbed stagecoaches—aside from the murder, that is. I had nothing of value for him to steal, and I wasn’t a lawman. If I learned something that connected him to the man in the newspaper, I would tell only the police and not give him so much as a hint of my suspicions. “I’ll stay with you only if I live in the servants’ quarters and you tell everyone that I am your housekeeper or maid,” I said. The speed at which the decision had been made was dizzying. It took a moment to sink in that I was about to live like a duchess in one of London’s best addresses for a week. When it did finally sink in, I had to bite the inside of my lip to hide my smile. The way he said it didn’t make me feel at all wretched for my situation. On the contrary, I felt like I’d done him a favor by accepting his offer of work. I supposed I had. The only other people who could point out all the watchmakers in the city were already in gainful employment and wouldn’t be available for the time-consuming task. He pocketed the handkerchief and, as his hand moved away, he went to touch the coat pocket that he’d touched several times the day before, only to check himself. He glanced at me and smiled again, but I wasn’t fooled. He was looking to see if I’d noticed. I smiled back, pretending that I hadn’t. With one hand holding onto my hat and the other picking up my skirts, we dashed across to the Oxford Street side. “Is the traffic as bad as this where you’re from?” I asked as we passed by a draper’s shop where a lovely red silk had been displayed to best catch the morning light. I tore my gaze away from the silks at his curt answer. It took a moment before I realized he wouldn’t want to give me too much information about himself if he were an outlaw. The notion both thrilled and worried me. “Do you live in a city or village?” I pressed on nevertheless. “Here and there.” He sidestepped around a boy carrying an empty crate on his shoulder and waited for me to catch up. He shortened his strides to keep apace with me. “I’m naturally inquisitive, but if I am to live in your house, I’d feel more comfortable if I knew you better.” There. That didn’t sound at all suspiciously nosy, simply cautious. “This looks like our first stop,” he said, nodding at the sign jutting out from the doorway still some shops away. He was definitely avoiding answering. Mr. Thompson’s shop was not unlike my father’s or Mr. Mason’s, although somewhat smaller. Rent was higher on Oxford Street and there was no space for a workshop at the back. I happened to know that Mr. Thompson no longer made watches or clocks, but sold ones manufactured in Clerkenwell factories. Mr. Thompson looked up from the cabinet, where he was rearranging watches, and smiled at Mr. Glass. He turned to me and the smile faded. “Miss Steele! What are you doing here?” He backed away and rounded the counter bench, placing it between us. “Good morning, Mr. Thompson,” I said, stepping up to the counter. He moved to the side, away from me. I followed, but he moved a little farther again and made a great fuss over the selection of watch chains laid out on a velvet mat. His gaze slid sideways, watching me. I hadn’t seen Mr. Thompson in two years, and clearly I hadn’t changed or he wouldn’t have recognized me. He’d been amiable to me back then, so why this odd behavior now? Mr. Thompson glanced at Mr. Glass and nodded a greeting. Mr. Thompson cleared his throat, looked at me then pointedly at the door. He couldn’t have been clearer if he’d shouted, “Get out!” at the top of his voice. I marched out of the shop, Mr. Glass at my heels. I puzzled on Mr. Thompson’s greeting until we reached the next watchmaker, a narrow shop of little more than a door’s width wedged between a jeweler and tobacconist. Mr. Baxter, the proprietor, had been a friend to my father and one of the few to come to his funeral, although he’d not stayed after the ceremony. I expected a hearty, friendly greeting at least, as he was a blustery, generous man whose character was as big as his barrel chest. Yet he too stood behind his counter to speak to me, as if it were a shield to hide behind, if necessary. Unlike Mr. Thompson, Mr. Baxter could hardly look at me, and seemed quite ill at ease, something that I would never have associated with him. We asked our questions, he gave brief answers, and Mr. Glass and I left without being any closer to finding Chronos. We had to cross busy Oxford Street to get to the next shop on my list, one that I’d been dreading before and felt even more anxious about now, after being received so strangely by both Mr. Thompson and Mr. Baxter. I couldn’t even describe their receptions as frosty. It was as if they were wary of me. Perhaps they expected me to argue with them over their refusal to allow me into the guild. They had, after all, voted against my admission, along with the other members. But it was the next watchmaker on my list who’d been most vehement in refusing me, according to Father after he returned home the night of the vote. Mr. Abercrombie was president of the guild and had held the position for the past few years because no one dared speak against him. He had inherited a fortune as well as the shop from his father and so could afford the best tools and supplies. The queen had purchased a clock from his father some thirty years ago, and Mr. Abercrombie had made an excellent living off the claim ever since. He now boasted the custom of princes and lords and had four staff working for him in his shop alone. He wielded power within the guild, with every other member bowing to his wishes. If he didn’t want a watchmaker to belong to the guild, then he wouldn’t be allowed in. Every member would vote as Mr. Abercrombie advised. And if a watchmaker couldn’t belong to the guild, he couldn’t legally sell watches in England. It was why Father had been so upset when my application had been refused—and it explained why he’d given the shop to Eddie instead of me. Eddie, as a man, was admitted. Abercrombie’s Fine Watches And Clocks was triple the size of Mr. Thompson’s shop and occupied a prominent corner. Mr. Glass held the door open for me, but I shook my head. I watched through the window. The slender figure of Mr. Abercrombie stood in the center of the shop, his hands at his back. With his oiled moustache and pince-nez perched on the edge of his nose, he looked as respectable as any of his royal clients. He directed one of his staff to take Mr. Glass’s hat and coat, but Mr. Glass refused. He spoke and Mr. Abercrombie responded with a quizzical expression. He spoke, presumably to offer to look at Mr. Glass’s special watch instead. Although his back was to me, I could see Mr. Glass heave a sigh. He must be tired of hearing the same responses. Mr. Abercrombie spread out his hands to indicate all his wonderful wares. My gaze followed the motion, and I couldn’t stop staring at the lovely mahogany long-case clock with the brass dial displayed behind the counter. It was quite a spectacular piece. Movement caught my eye, and suddenly Mr. Abercrombie came marching through the door. He caught my arm before I could run off. His only response was to dig his fingers in more. I winced as the nails bit through my sleeve to my skin. “Unhand Miss Steele,” came the low growl from behind Mr. Abercrombie. I hadn’t seen Mr. Glass emerge from the shop, but he now appeared over the watchmaker’s shoulder, a dark scowl scoring his forehead, his eyes as black as thunderclouds. If I were Mr. Abercrombie, and Mr. Glass had spoken to me in such a fiersome way, I would have done what he’d demanded—and quickly. But Mr. Abercrombie didn’t. “Tell me what it is you really want or I’ll accuse her of theft,” he said. “You can’t accuse me of stealing when I’ve nothing of yours,” I snapped. “Let me go, Mr. Abercrombie. You’re hurting me.” The blood had indeed stopped flowing to my lower arm and hand. My fingers throbbed. Mr. Abercrombie pulled me against him, grinned in my face, and slipped something inside my pocket. I didn’t need to look to know that it would be a watch.